Luke Cole scored twice in Racers' 4-1 win at Coventry Copsewood. Racing Club Warwick manager Scott Easterlow is hoping the club’s Birmingham Midweek Floodlit Cup final appearance can usher in a bright new era for the club. 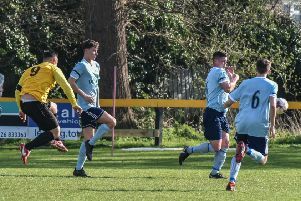 Two goals apiece for Luke Cole and Trea Bertie earned Racers a 4-1 win at Coventry Copsewood in the semi-final on Tuesday evening to set up a showpiece against Atherstone Town. “Copsewood made it interesting at 2-1 but we should have been well out sight by then,” said Easterlow. “Even when it was only a one-goal deficit I always thought we were in control. “It’s great that the club has a cup final to look forward to at the end of the season. The midweek win helped cushion the blow of Saturday’s 3-2 Midland League Division One defeat at Ilkeston Town which well and truly ended any remote hopes of a title tilt. Late goals from Luke Church and Sean Kavanagh brought some respectability to the scoreline but Easterlow was under no illusions that his side were well beaten. “We weren’t at it on Saturday but it’s hard, we have a lot games. Racing Club are in league action at home to Alvis tomorrow before travelling to Nuneaton Griff on Saturday.